This is the twelfth post in a series about my possible line of descent from Eleanor of Aquitaine. In the first post, I explained how I discovered the possible line, and how I am going to verify it one generation at a time. In the last post, I proved that my seventh great-grandmother Petronella van Vlijmen was the daughter of Hugo Dirck Huijgen and Jenneken Laureijs Denis Peeters. A guardianship record of guardians over her children. These records will be analyzed for clues about Jenneken’s own parents. The name of the father who assisted her matches the patronymics of Jenneken, both providing direct evidence about the identity of her father. The string of patronymics identifies him as Laureijs, son of Denis, son of Peeter. A last name is not given—not unusual in this time and place. Dionisius, son of Hubertus Dircken and Joanna was baptized 18 October 1680. Witness was Catharina Adriaen Claesen.3 See the previous post for an explanation why Dionisius belongs to this family despite the difference in the name of the father. The mother is identified as Joanna, the Latin form of Jenneken. Daughter Laurentia may have been named after Jenneken’s father Laurens. 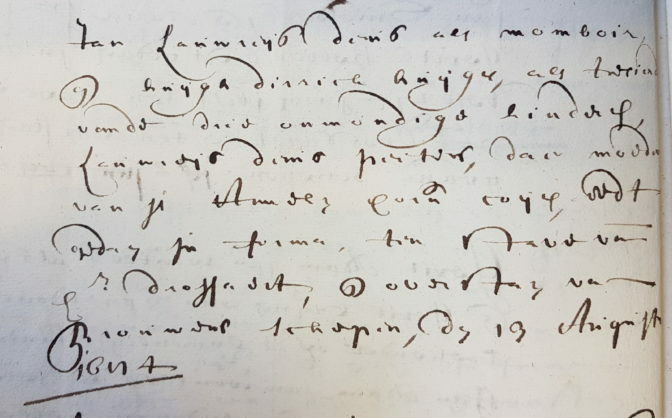 “Lafferijns Denis Peters,” living at the Heikant, had been buried in Tilburg on 5 February 1684, a month before Laurentia’s baptism.9 Naming a child who was born just a few weeks later after him would be a normal thing to do. Dionisius (Latin form of Denis) may have been named after her grandfather. Based on his patronymics, the supervising guardian Jan Laureijs Denissen was probably a brother of Jenneken; a logical choice for the role. The number of seven children matches the information from the baptismal records, which suggests that none of the children died in infancy. However, that is inconsistent with the number of children in the 1688 census which showed three children under the age of sixteen while five children had already been baptized then. It is possible that there were other children whose baptisms weren’t found, or that the census recorded the wrong number of children—perhaps because the information had been collected earlier than 1688. Hugo and Huijgh are variations of the same name. No other Hugo Dircken was found in Tilburg in this period, so this burial is probably for Jenneken Laureijs Denis Peeters. The burial record does not provide any other identifying information nor information about her parents. Joanna is the Latin form of Jenneken and Vreijs is a variation of Laureijs so the names of the child and her father are consistent with the bride in the 1678 marriage record. Her age of 23 years old at the time of the marriage also matches. The repetition of the names Maria (3x) and Petrus (2x) suggests that several of these children died as infants. Joannes, or Jan in Dutch, could be the supervising guardian from the 1699 record. Her oldest brother would be a logical choice. Joanna/Jenneken was baptized nine months later. Jenneken was also from Heikant according to her own marriage record. The mother is here called Anneken Cornelis Coijen, while her marriage record called her Anneken Cornelis Peeters. In this time and place, it was not uncommon for people to be called by their patronymics in one record, and by a last name in other records. Her first name and first patronymic (Anneken Cornelis) match, as do the first name and both patronymics of the husband. This combination proves that this is the same couple. The fact that she was listed as the mother of the children in 1684 shows that Laureijs’ children all had the same mother. Supervising guardian Huijgen Dirrick Huijgen was Jenneken Laureijs Denis Peter’s husband, whom she married in 1678. Jan was the oldest surviving brother. Jan and Jenneken were the only children over 25, the age of majority. The presence of Huijgen Dirrick Huijgen as supervising guardian of the children of Laureijs Denis Peeters and Anneken Cornelis Coijen is indirect evidence that his wife was their daughter Joanna/Jenneken. This record shows that Huijgh Dirick Huijgen’s wife Jenneken Laureijs Denissen was the daughter of Laureijs Denisse and Anneken Cornelis Koijen. This shows that the Van Vlijmen family lived next-door to the widow of Denis Peter Anthonis. The first name and patronymic of the widow’s late husband match the patronymics of Jenneken’s apparent father Laureijs Denis Peters, suggesting the neighbor might be her grandmother. 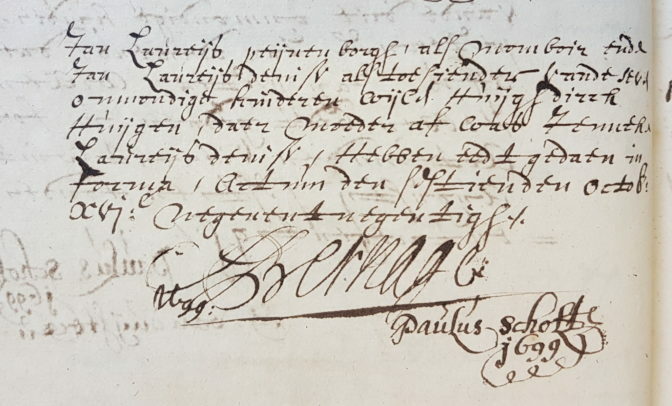 Denis was baptized in Tilburg under the Latin version of his name as Dionisius, son of Laurentius Denisen and Anna, on 16 February 1667.21 He must have been one of the minor children of Laureijs Denis Peters and Anna Peters Coijen of whom Huijgh Dirck Huijgen was the supervising guardian in 1684. Not having reached the age of 25 when he married in 1690, he would have needed to have a guardian present. His first wife Jenneken Lauwreijs Wijtmans was probably the Joanna Denis Lauwreijs Denis who witnessed the baptism of Joannes, son of Hugo and Jenneken in 1692.22 Women sometimes used the names of their husbands as means of identification. In this case, it was Joanna, wife of Denis Lauwreijs Denis who witnessed the baptism rather than the daughter of. Wijtman Lauwreijs Wijtmans who appeared in the 1699 estate division was probably her brother, appearing on behalf of her children with Denis Lauwreijs Denis. All the pieces of the puzzle fit together. 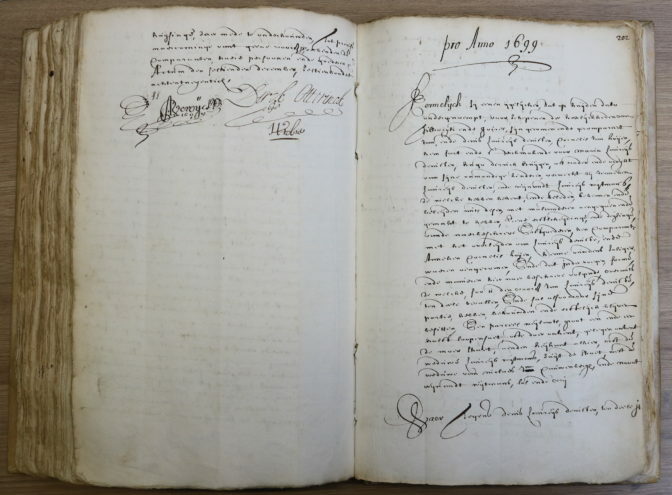 The marriage record of Huijgh Dirck Huijgen and Jenneken Laureijs Denis Peters identified her father as Laureijs Denis Peters. The estate division of her parents confirmed that she was the daughter of Laureijs Denisse and Anneken Cornelis Koijen, which fits with her baptismal record and their marriage record. Associations between Huijgh Dirck Huijgen and the children of Laureijs Denis Peters and Anneken Cornelis Koijen, also known as Peters, confirm the relationship. The analysis for this generation shows that research in this area in the 1600s requires a wider range of sources. Church records in this period don’t always identify both parents. Court records such as guardianship appointments or estate divisions are an important source of information about family relationships. Combining evidence from church and court records can prove relationships even when names are not used consistently. That is eleven generations down, seventeen to go! Aldermen’s Court (Tilburg), marriage register 1677-1678, page 40, Huijgen-Peeters (4 February 1678); “Zoek een persoon,” index and images, Regionaal Archief Tilburg (http://www.regionaalarchieftilburg.nl : accessed 7 May 2016). St. Dionysius Roman Catholic parish (Tilburg), baptismal register 1650-1687, Wilhelma Huijg Dircken (1 February 1679); “Zoek een persoon,” index and images, Regionaal Archief Tilburg (http://www.regionaalarchieftilburg.nl : accessed 7 May 2016). St. Dionysius Roman Catholic Parish (Tilburg), baptismal register 1650-1687, Dionisius Hubertus Dircken (18 October 1680). 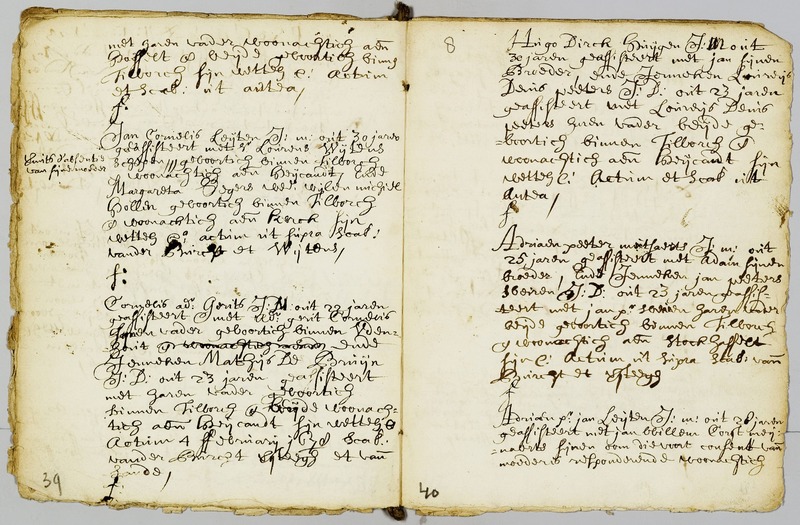 St. Dionysius Roman Catholic Parish (Tilburg), baptismal register 1650-1687, Petronella Hugo Dircken (28 June 1682). St. Dionysius Roman Catholic Parish (Tilburg), baptismal register 1650-1687, Laurentia Hugo Dirck Huijgen (30 March 1684). 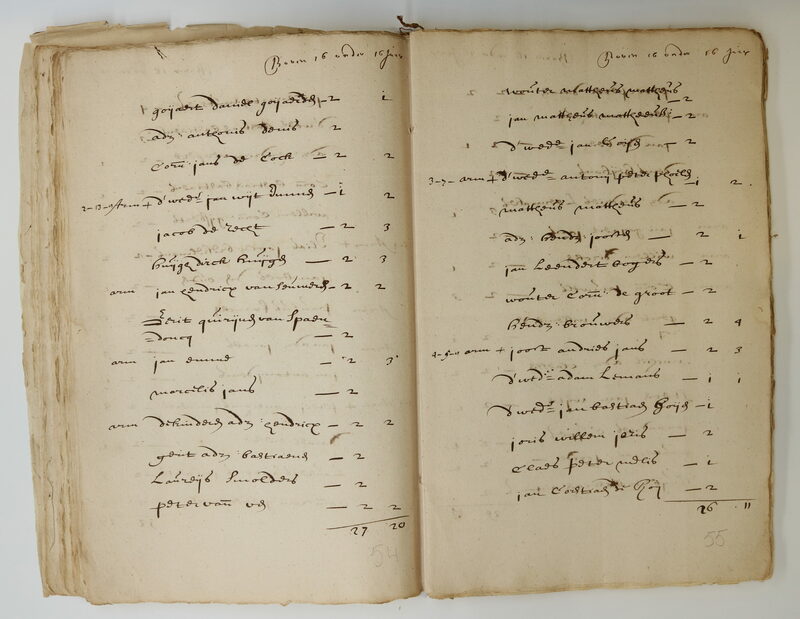 St. Dionysius Roman Catholic Parish (Tilburg), baptismal register 1650-1687, Theodorus Hugo Dircken (12 April 1686). St. Dionysius Roman Catholic Parish (Tilburg), baptismal register 1687-1696, Alegundis Hugo Dirck Huijghen (1 December 1688); “Zoek een persoon,” index and images, Regionaal Archief Tilburg (http://www.regionaalarchieftilburg.nl : accessed 7 May 2016). St. Dionysius Roman Catholic Parish Tilburg), baptismal register 1687-1696, Joannes Hugo Dirick Huijg (1 June 1692). Tilburg, 1688 census, p. 54, Huijgh Dirck Huijgen; call no. 333-A1, Dorpsbestuur [Village administration] Tilburg, Record Group 3; Regionaal Archief Tilburg, Tilburg. Aldermen’s Court (Tilburg), guardian oaths 1687-1700, children of Huijgh Dirck Huijgen and Jenneke Laureijs Denissen (10 oktober 1699); call no. 8492, “Schepenbank van Tilburg en Goirle” [Aldermen’s Court of Tilburg and Goirle], Record Group 14; Regionaal Archief Tilburg, Tilburg. Dutch Reformed Church (Tilburg), burial list 1686-1700, p. 56, Huijg Dircken vrouw (19 November 1694); “Zoek een persoon,” index and images, Regionaal Archief Tilburg (http://www.regionaalarchieftilburg.nl : accessed 23 December 2017). 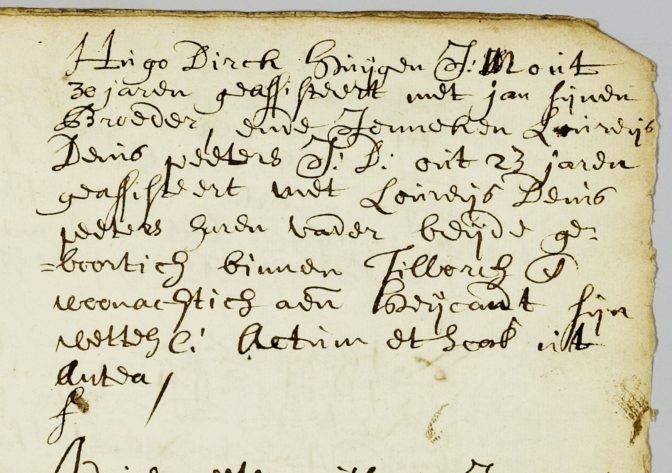 St. Dionysius Roman Catholic Parish (Tilburg), baptismal register 1650-1687, p. 60, Joanna Vreijs Denis (6 december 1654). 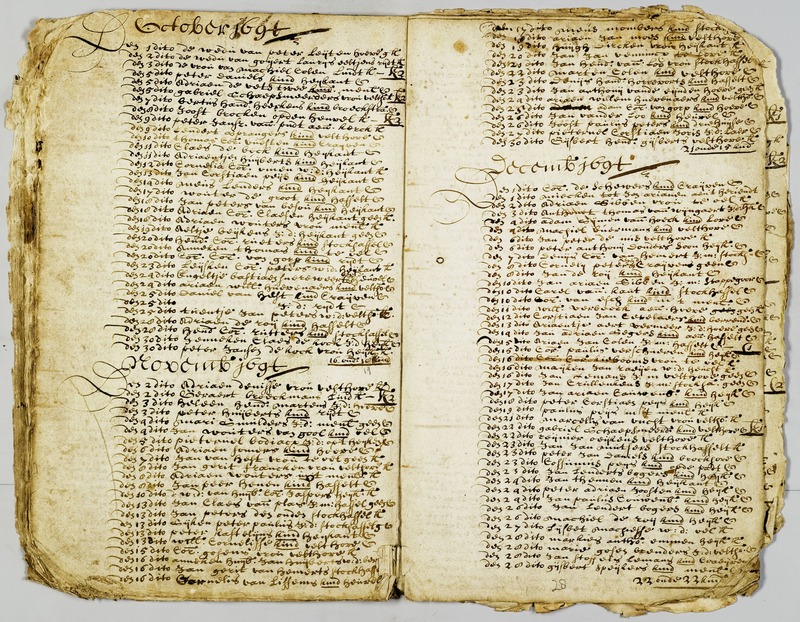 St. Dionysius Roman Catholic Parish (Tilburg), baptismal register 1650-1687. 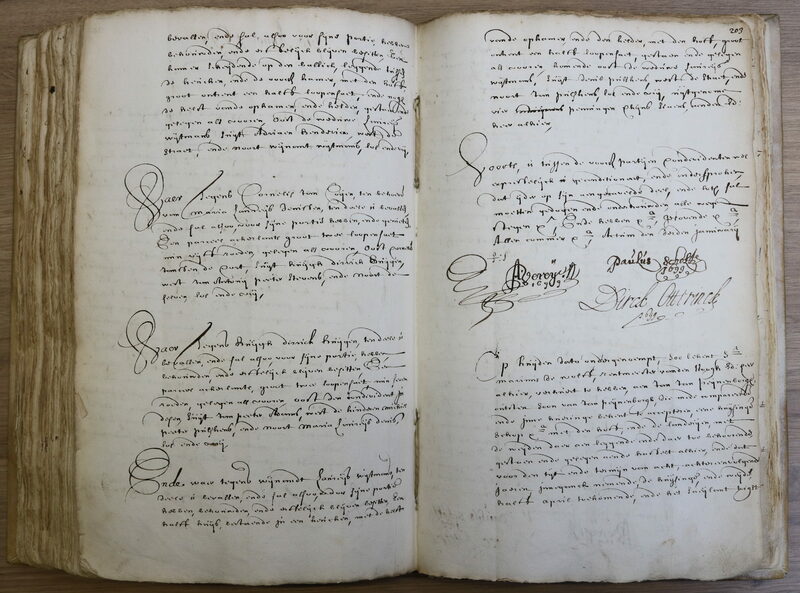 Aldermen’s Court (Tilburg), guardian oaths 1681-1687, children of Laureijs Denis Peeter and Anneken Corn. Coijen (1 August 1684); call no. 8491, RG 14. 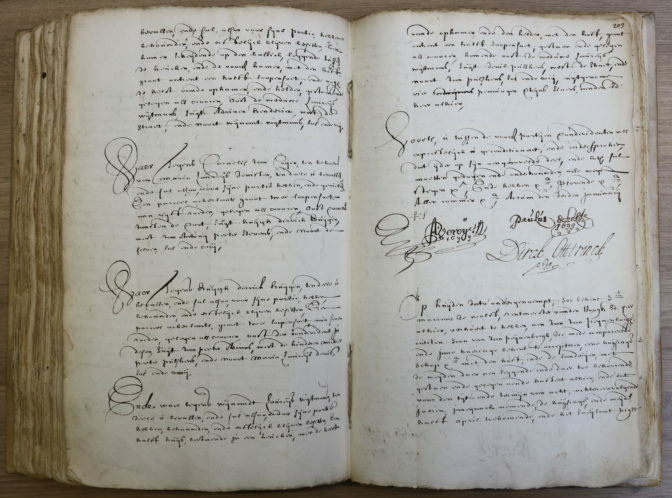 Aldermen’s Court (Tilburg), miscellaneous records, 1692-1699, fol. 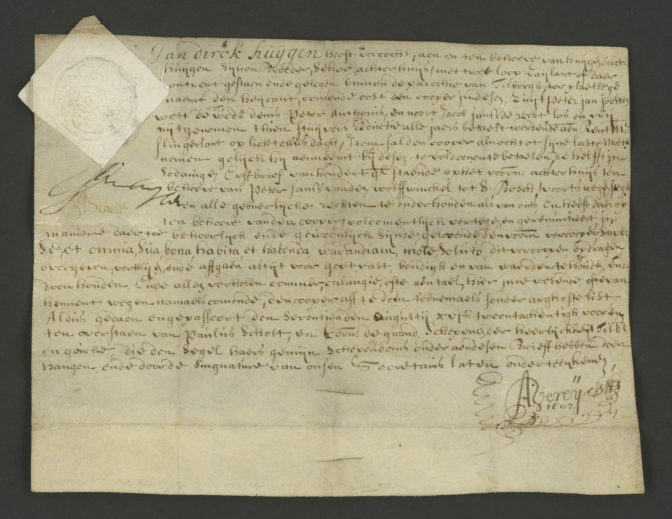 202r-203r, estate division of Laureijs Denissen and Anneken Cornelis Koijen (4 January 1699); call no. 8072, RG14. Aldermen’s Court (Tilburg), marriage register 1679-1712, page 196, Denis-Wijtmns (10 March 1690); “Zoek een persoon,” index and images, Regionaal Archief Tilburg (http://www.regionaalarchieftilburg.nl : accessed 25 January 2018). Dutch Reformed Church (Tilburg), marriage register 1671-1701, p. 291, Pulskens-Meermans (31 October 1700); “Zoek een persoon,” index and images, Regionaal Archief Tilburg(http://www.regionaalarchieftilburg.nl : accessed 25 January 2018). St. Dionysius Roman Catholic parish (Tilburg), baptismal register 1650-1687, Dionisius Laurentius Denisen (16 February 1667). De volgende zin loopt niet: In this case, it was Joanna, wife of Denis Lauwreijs Denis who witnessed the baptism rather than the daughter of. Wijtman Lauwreijs Wijtmans who appeared in the 1699 estate division was probably her brother, appearing on behalf of her children with Denis Lauwreijs Denis. This series remains great! It’s amazing that you have eleven generations already. The amount of research that each successive generation requires is definitely going up, but you lay it out very clearly. You make it look simple, when I know it’s probably anything but simple. Your series inspired me to shore up my own research on one of the lines I did way in the beginning of my genealogical journey. Plus looking at your source citations helps me craft my own. I posted the first post today. So thanks for the inspiration!